My monthly favorites posts are back! I needed a little break to rethink formatting and to get inspired again. What used to be a last-minute throw-together post will now be one of my favorites I think. I like a lot of different types of things, so it’s nice to have a little home for randomness on my blog. * These pink Anthropologie glasses that I’ve wanted for ages. We have more than enough cups, but every time I use these glasses they make me happy, and that’s what counts right? * Mini hoop set. One of my best super affordable purchases in a minute because I wear these nearly every day. Oh so chic! * Perfect layering necklaces. I love the layered necklace look, but sometimes it takes planning and strategic purchases. I’m so happy I picked up this necklace and this necklaces over the holidays. I wear them so frequently both on their own and layered. 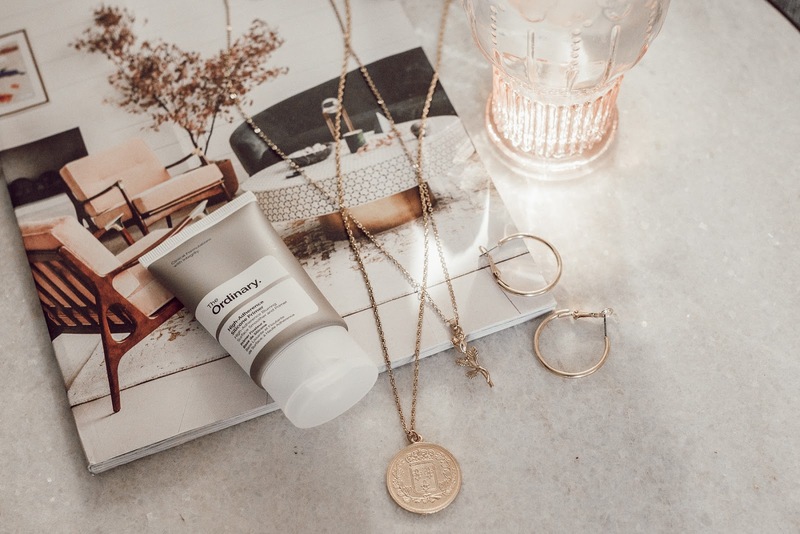 * The Ordinary High Adherence Silicone Primer. I ordered this primer on a whim, and have really, really loved it so far. It smooths out my skin, keeps my oily self matte all day, and is only $4.90. Enough said. * Dove Volume & Fullness Dry Shampoo. My friend Jo talked me into straying from my staple dry shampoo to try this one, and I’m so glad I did. It truly refreshes my roots, doesn’t leave a white residue, and has a pleasant smell without being overpowering. * Tarte Amazonian Clay 12-Hour Full Coverage Foundation. Estee Lauder Double Wear is still bae, but it can sometimes be a bit too dry for me in the winter months (creasing is not cute). Enter this lovely whipped formula. I’ve been mixing it 50/50 with my Double Wear to create the perfect winter formula! * Olly Undeniable Beauty Vitamins. These are my favorite hair, skin and nail vitamins because they truly work! My hair has never grown quickly in my life, but I have very noticeable hair growth when I take these consistently. They’re a bit more than I’d like to pay in an ideal world, but if you’re trying to grow your hair out, I can’t recommend these enough. * Hopper. You can use this app to track all kinds of different flights, and it will alert you when the prices drop. I booked cheap flights to San Diego for Trey and I thanks to a handy push notification from this app, so it’s kind of my favorite thing right now. * FriendO. This is a fun little game that I’ve been playing back and forth with my friend Jo. Basically you answer random questions about yourself and your friend guesses your answer. * Kristin Ess’ new products at Target. I’ve tried a few of her products and love them, so I’m excited that she’s released even more. Also, her packaging/branding makes my heart sing! * Floral + striped top from Forever 21. This quirky little top drew me in immediately! The print, the little bell sleeves, the price - love. I wore it in this Instagram post, but you'll definitely be seeing more of it. * Stranger Things Season 2. Trey and I recently binge-watched it and loved every second! I thought it was even better than the first season, and I *loved* the character development. Honestly, is there a show with better characters? I can't get enough of them.